The University of New Brunswick wrapped up the largest fundraising campaign in its history on Friday, with a bi-campus victory party that gave students 125 million reasons to celebrate. It Begins Here: The Campaign for the University of New Brunswick was launched in November 2016 with the goal of raising $110 million for student support and faculty research. "10,000 alumni worldwide joined in to help bring us to this moment," said Dr. Eddy Campbell, UNB president and vice-chancellor. "I am delighted to announce that we have not only met our $110-million campaign goal, we have exceeded it by $15 million. And all of this support, 100 per cent, has come from the private sector." The It Begins Here campaign had five key objectives: giving students a great start; investing in faculties; building on UNB's research strengths; preparing students to succeed in the world; and leading Canada's next wave of innovation. In a first for the university, more than 50 per cent of the campaign goal was dedicated to student financial support. Capacity-crowd audiences in UNB Saint John's Ganong Hall Lecture Theatre and the John Meagher Auditorium of UNB Fredericton's new Kinesiology Building cheered as campaign co-chairs Dr. David Ganong (BBA '65, LLD '12) and Dr. Robert Quartermain (BSc '77, DSc '09) announced the over-the-top success of the campaign after a dramatic countdown. Dr. Ganong and Dr. Quartermain thanked all those who played a role in helping the campaign exceed expectations. "Our UNB community includes students, faculty, staff, alumni and corporate and community partners," Dr. Ganong said. "It is a community of shared opportunity and common purpose, whose members are working together to ensure that students will continue to benefit from the same experiences that made our time at UNB so valuable." 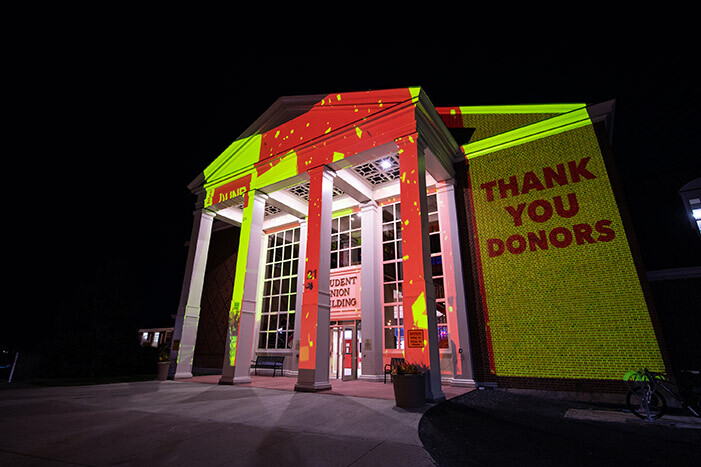 "By pooling our efforts and resources, we have achieved something remarkable today: the largest fundraising drive in UNB history, with 50 per cent of the proceeds dedicated to student support," Dr. Quartermain said. "Thank you for choosing to make a difference in the lives of our students. It truly does begin here. It truly does begin with you." Dr. Campbell attributed the success of It Begins Here to the hard work of the co-chairs and campaign cabinet, and to the national reputation that UNB has earned as one of Canada's top comprehensive universities. "For a number of years now, I've been saying that UNB has a great story to tell, if only we could get more people to hear it," Dr. Campbell said. "Bob and David and our campaign cabinet members have taken the story of what faculty and students are accomplishing at UNB and carried that message all across the country." "At UNB, we want to be known for the difference we are making in the world - and based on the results of this campaign, I believe we can say with confidence that our story has been heard. We have earned the support of some of the greatest alumni, corporate and philanthropic changemakers in Canada," Dr. Campbell said. Lead donors include celebrated New Brunswick entrepreneurs such as Richard J. Currie, Gerry Pond and the Irving and McCain families; Atlantic Canadian corporations such as Emera Inc., Irving Oil, J.D. Irving, Limited and OSCO Construction Group; six of Canada's largest banks, including Bank of Montreal, CIBC, National Bank, RBC, Scotiabank and TD Bank; and top Canadian and international philanthropists, such as Desh Deshpande, Stephen Jarislowsky, Ron Joyce and Seymour Schulich. "The momentum has been phenomenal. It just seemed to build, month after month," said UNB Chancellor Allison D. McCain. "I was especially pleased that we could announce three major new initiatives at today's campaign celebration - a gift of $500,000 from The Jarislowsky Foundation, which comes on top of its earlier gift of $1.5 million in health research funding; a gift of $400,000 from Dr. Robert Quartermain to create the Allan and Elizabeth Quartermain Research Fund, and a commitment from Osisko Mining Inc. of $250,000 for field education in Earth Sciences." Some of the last words at the event went to students who have benefited from scholarship creation. Meaghan Laaper, a third-year bachelor of arts student majoring in English on UNB's Fredericton campus, said, "Scholarships show support for our goals and give us the encouragement to continue to chase them. This campaign, and the support it will give to students, will be life changing. It has been for me." Chloe Dallon, a third-year student studying engineering at UNB Saint John, thanked donors for giving students the opportunity and the confidence to pursue their ambitions. "Knowing that all these people believe in me and my abilities makes me feel powerful, like I can accomplish anything I put my mind to," she said. "Their support encourages me to be my best possible self, and to share this positivity and kindness with others in my community."